Last days Ma Mi Duo, Nadio MArenco (accordion) and Cristina MIrkovic (violin), made a great perfomance at our studio. They recorded sixteen tracks from typical tango to Eastern Europe popular themes for their new album “Tango & Co.”. I worked on tracking, mixing and mastering for all songs. Very fine musicians and great gears done amazing work. It’s not a didactic section (when needed I’ll link related pages on manufacturer site) but so as to explain my approach to recording. before talking about my analog consolle I want to expand my point of view on some questions about the summing and the mixing. The result of summing is a single signal (electric or digital) from several sources(*), the problem is how to make it without quality drop. Obviously that signal can be mono, stereo or multichannel in order to destination. Theorically analog or digital summing are the same, but in real world, analog gear has a non-linear response with typical distortions on second harmonics and cross-talking. Digital summing can emulate it or capture the nuances of analog gears with convolution to add “warmth” and depth to mix. Assumed that you used a good microphones and preamplifiers to capture several instruments, it’s probably necessarily change their timbres, levels and dynamics to make a pleasure sum. This is a basic approach to mix. Computer become a DAW (Digital Audio Workstation) and it’s added with audio card with AD/DA converter and specific softwares. Nothing of their is the best choice but each can be a better way to work into a specific situation. I chose two solutions: ITB and OTB. To work ITB I chose Apple Logic Pro (since 1996 – 2.5.4 version) with many plug-ins like Waves, Softube, Metric Halo, Brainworx, SPL and Abbey Roads (this last is discontinued – ouch). Alternative DAWs available are ProTools 10 and Harrison Mixbus 2.x. ITB mix is a cheapest way to add many times the same expensive (but virtual) compressor or reverb, to create automation for all parameters available, to edit takes, to create incredible audio effects, to add and manage virtual instruments and to add samples to substitute or sum it with original recording. At last to save and restore the project with one “click”. But after many years I realized an innate problem in ITB mixing. If it’s true that when I add plug-ins the relative delays (into DAW) are automatical compensated, the delay due in conseguence how to CPU works (multiplexing) affects time alignment of all channels into sum (unlike analog consolle where all signals are process in a parallel way). That phenomena is audible in complex mix with many tracks and many plug-ins and it’s highlighted with a shifting the mix to muddy sound with a depth deterioration. Let’s be clear ITB mixing is good choice but adding plug-ins without limits can shift your sound in trouble although your high perfomance pc system. Just the same of any machinery when is overfilled. It’s odd to note how many phase or time alignment plug-ins are maded in last years although digital recording has less problems about phase correlaction compared with vynil cutting. To realize OTB mixing I bought a second-hand consolle, directly from eighties, D&R Dayner. Ok, now I go to present it. 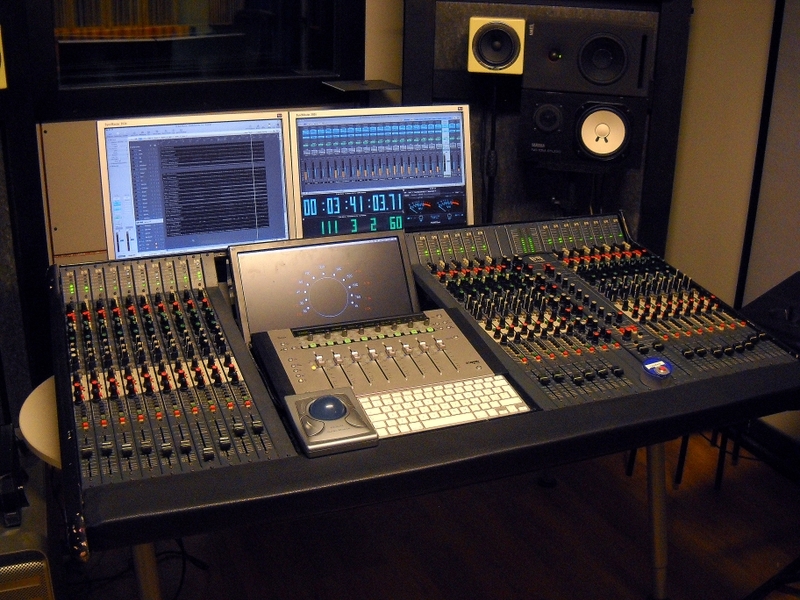 This is a tipical studio in-line consolle, with direct outs, tape returns, eight busses and eight auxiliaries. It has 24 channels and eight effects return and I did broaded it frame to insert Euphonix MC Mix control surface, Apple keyboards and third screen of my DAW. Dayner peculiarity is it floating busses (named subs), that is the possibility to assign any bus to any channel (along left/right assignement). Tape output and monitor section are substitute by bus signal. It’s useful to send to recorder premixed channels. Then it’s possible to work from 24 channels without busses to 16 channels and 8 busses. 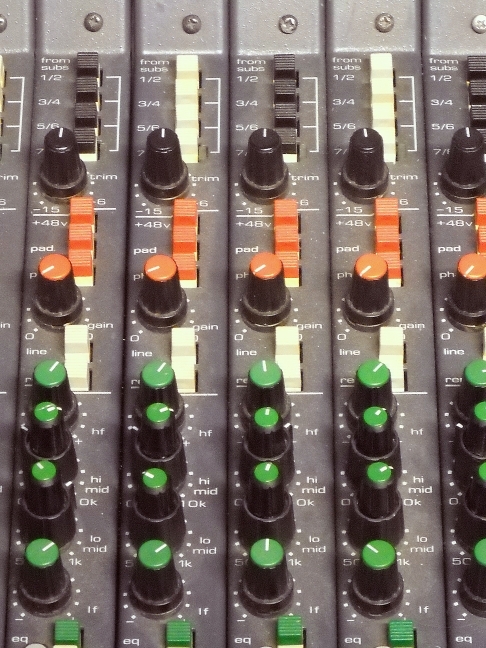 They have three kinds of channels: In-Line, Split and Tape/Effects return. In-line: it’s a basic channel, it manage mic and line input with eq, aux sends and volume. Also it manage tape return on specific input and monitor section. It’s possible invert input with tape return to mix the latter (remix switch). Bus assignement send it to tape out and monitor section without possibility to assign it to main. Split: it’s the dedicate channel to manage floating bus on mixing with assignement to main. It haven’t tape return section. I haven’t split channel but on In-line channel I chained tape out with line-in to replicate their. In this way I can applied insert and complete eq section on bus signal and mix it. Tape/Effects return: it has four balanced line input. They are perfect to manage extra eight channel to mix. Today I use it chained with two channel strip Focusrite ISA220 and to input stereo effects return from DAW. I tested Dayner bandwidth with Spectrafoo and DAD AX32 at 96kHz (see test here) and the eq too. 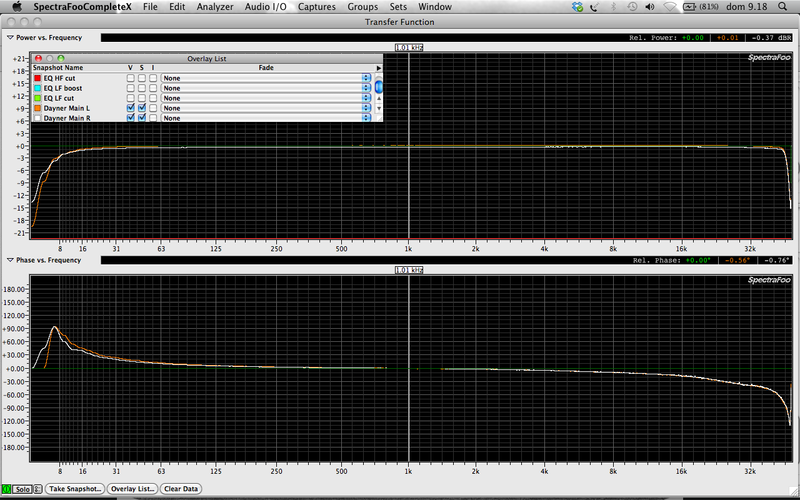 I like the eq of Dayner, it works in mellow way without artifacts. It sounds great on drums and electric bass. The eight auxiliaries are routed to DAW to applied reverb, delay or modulation effect. I can mix from 32 channels without group to 24 channels + 8 groups (busses). I’m very happy for my Dayner consolle, I suggest it to mix rock, blues and jazz (acoustic and electric). To get it solved i changed all audiofiles names and I located them after opening the project…. At this point I had not more problems (I couldn’t believe) and I bounced (Logic worked very slow ) the project into stereo file. Just authorized by my customer I’ll link one or more songs of this work. last saturday night I recorded a jazz concert with my mobile station based on Joeco BlackBox BBR1U. Very fine piece of gear, it’s very stable, it has a very good converter and it records 24 tracks at a time with a sample rate up to 96kHz@24bit. BBR1U writes the data streaming directly on external hard disk (USB 3.0) in Wave broadcasting format. Ok, I recorded, now do I have to mix these tracks, right? Normally my DAW is Apple Logic Pro 9 but by now I verified that it doesn’t work fine with audio files made on BBR1U: problems to open the project and instability done. Although these problems yesterday I mixed with Logic and the sound was very fine. Today back in my studio and the project doesn’t started! At last I resolved by saving all files in AIF format (one by one) with Logic Sample Editor window and now it work fine! So, don’t work Logic with Wave broadcasting? Surely I founded many problems. Note: today I tried with Pro Tools 10 native and with Harrison Mixbus too and they worked fine (but by now I mixed with Logic). Tomorrow I’ll close mix and I’ll deliver it to my customer.